Virgin Australia is the largest of the Virgin-branded airlines and is also one of the largest airlines in Australia. 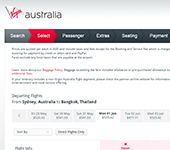 The company was founded by Sir Richard Branson in the year 2000 and operates low-cost domestic flights throughout Australia as well as international flights to destinations in Southeast Asia, Oceania, and the west coast of the United States. 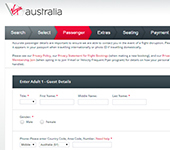 The Virgin Australia website is clean and modern with a prominent flight search tool but offers few other useful tools at first glance. For example, passengers must go to the bottom of the “Bookings” pull-down menu to see basic information such as flight status or perform standard procedures like online check in. 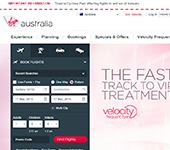 However, the website does include a clear button to find information about Virgin Australia's Velocity frequent flyer program including the hotel and rental car partners with which passengers can redeem their points. Unlike other Virgin-brand airlines, Virgin Australia offers a Business Class cabin which features generous leather seats, complimentary amenity kits, and gourmet meals with wine. The company also offers a Premium Economy cabin with in-flight Wi-fi and pre-flight lounge access. Virgin Australia also offers a section of holidays which pair Virgin Australia flights with hotel stays at top tourist destinations throughout Australia. Where is Virgin Australia located?